Win this app on Facebook October 2014!! Do you remember the days of AAC before iPads and iPhones? I do! I remember giving children AAC devices that cost more than my first car, and then bribing them use it with cheerios or other treats. These devices were stigmatizing on the playground, a huge pain to program, and were bulky and difficult to lug around and try and get kids to use. It’s amazing how different things are now. You pay a fraction of the price of those old devices for an app which is stored on an iPad or iPod Touch. A device that instead of being stigmatizing is actually seen as “cool” by other kids. Most importantly a device that kids LIKE using! No longer are outside bribes necessary, most kids actually enjoy the iPad! And with guided access you can control when they are using it for communication and when they are using it for other learning or leisure activities. 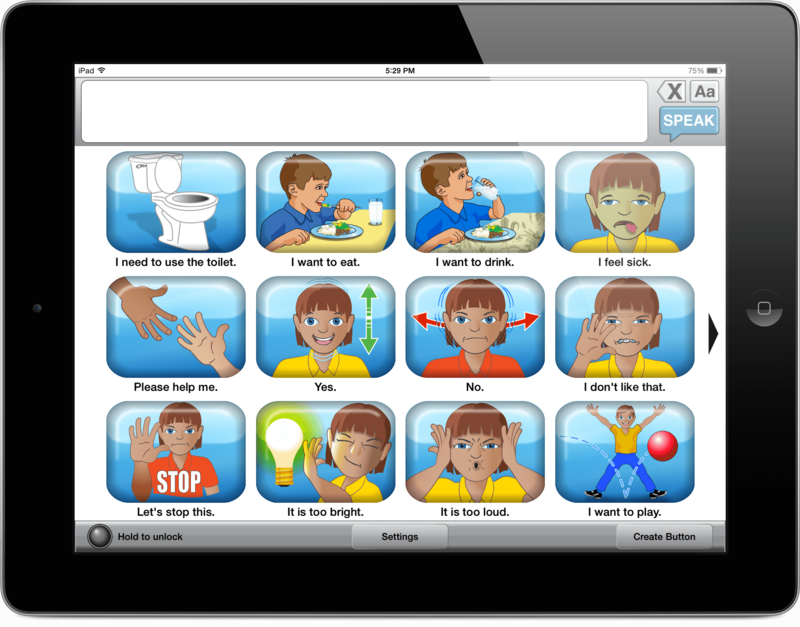 Avatalker AAC is one such augmentative and alternative communication (AAC) app available on the iTunes app store. 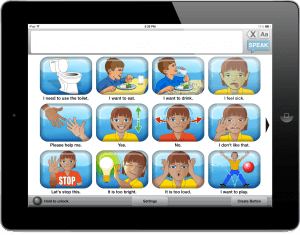 Avatalker, (pronounced ‘ave-ah-talker’) has been endorsed by the National Autism Association, and features a robust 2,000+ word vocabulary and proprietary graphics library by Aurora Symbols. 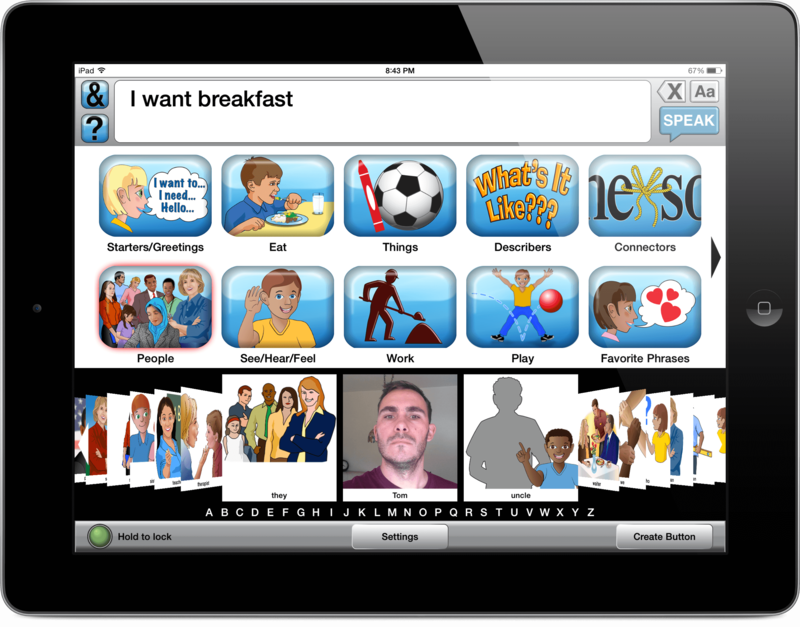 Like all AAC apps, it gives nonverbal children and adolescents the ability to build phrases and sentences using pictures, which are then converted to audible speech. When you open the app, you have the option to choose stage 1 or stage 2. This only allows access to the “Favorite Phrases/Stage 1” board, which is a great beginning step for someone using the app on their device. This board has 22 common words and phrases such as “I need to use the toilet” and “Hello.” What shows up in this stage is fully customizable in the “settings screen.” You can choose what items show up as well as add pictures of personal items and enter the text that the device will “speak.” In the settings screen you can also choose how many buttons show up on each screen so that you can start with just two large buttons if you are teaching the very beginning stages of using an AAC app. 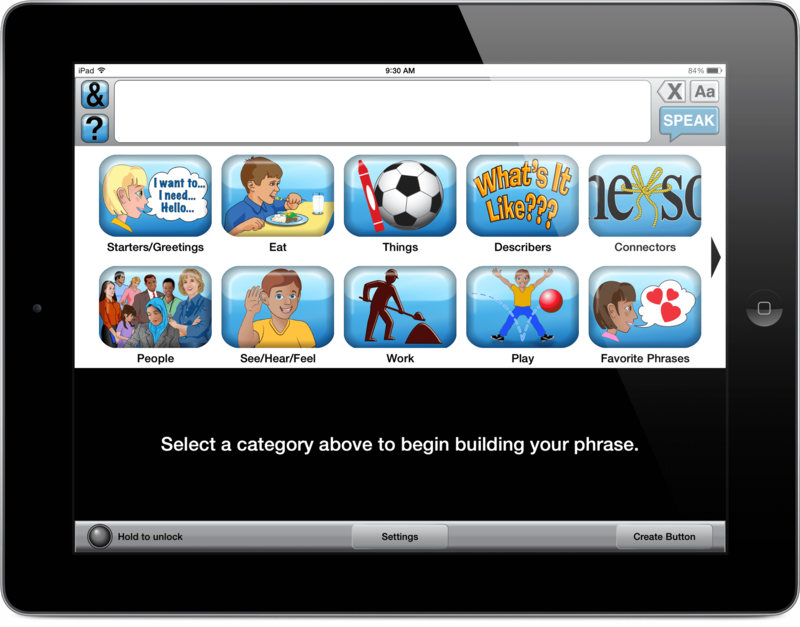 Stage Two allows access to all of the different categories and words in the app. The app opens up to categories such as “Starters/Greetings”, “People” and many others. When a category is chosen the words in that category appear along the bottom of the screen. When a word/phrase is chosen the text appears in the bar at the top of the screen. Once the sentence is complete tapping the “speak” button on the right of the top bar will say it out loud. Advanced features for grammar are offered, but they can be removed in the settings if they are too distracting. Caregivers can customize Avatalker’s library, adding familiar names, words and images, or even complete custom sentences or phrases for easy access to frequently-used messages. Avatalker is incredibly scaleable, and can be customized to accommodate low-to-high functioning nonverbal children. The ability to vary the size of the icon buttons is especially helpful for those with motor planning challenges. 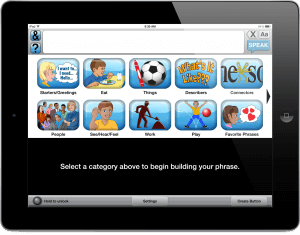 The app is easily customized for an individual child. Once you choose a level, the boards themselves can be moved around, re-named and you can easily hide as many buttons as you need to. This is great for kiddos who are just starting out and need help guiding their attention to the target button. When your child or student is ready, the buttons can easily be added back on. Avatalker is also set up well enough that you don’t need to spend a lot of time “setting it up” before you use. You can jump right in with your student, child or client and then make small changes as they come up. 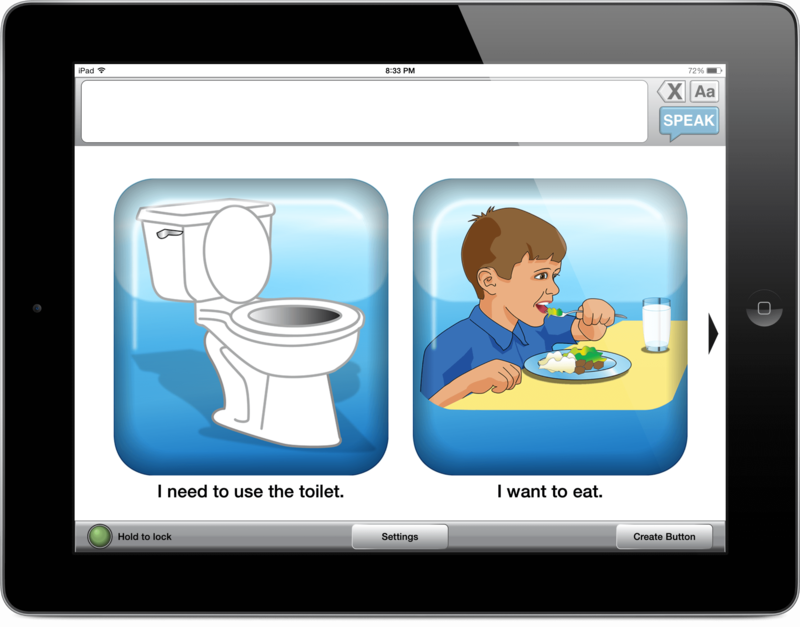 The website for Avatalker contains tons of support and resources including video walk-throughs of the app. At the time of writing this review Avatalker AAC retails for $189.99. Jenny is a board certified behavior analyst (bcba) who spent over a decade working with children diagnosed with autism spectrum disorders, Down syndrome, and other intellectual disabilities. She has worked with clients across a wide variety of ages, ability levels and settings. She earned her Master’s degree from The Chicago School of Professional Psychology- LA, and became a board certified behavior analyst in 2011. She has been a presenter at ABA conferences, and has lead workshops and trainings for parents, teachers and other caregivers.